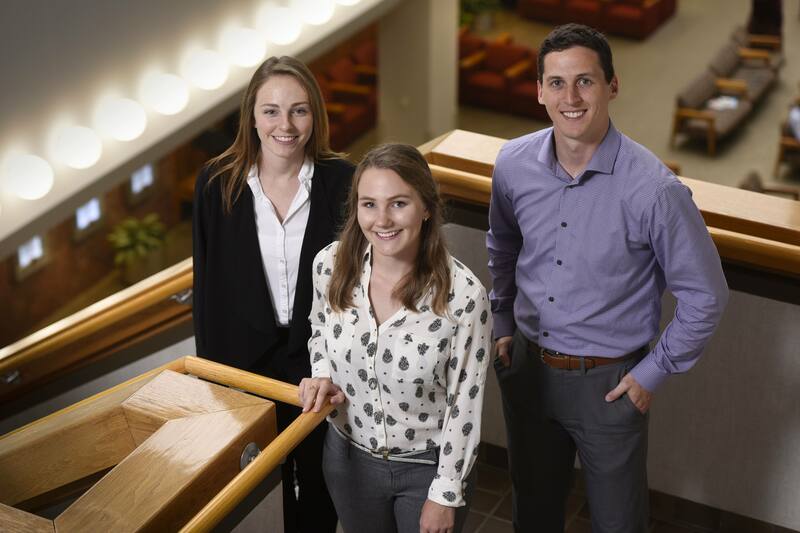 The first class of students in the Regenerative Sciences Training Program: Paige Arneson (biochemistry & molecular biology), Emma Goddery (neuroimmunology), and Christopher Paradise (molecular biology & experimental therapeutics). Seeking to spur development of innovative medical breakthroughs, Mayo Clinic Graduate School of Biomedical Sciences has started one of the nation’s first doctoral (Ph.D.) research training programs in regenerative sciences. The Regenerative Sciences Training Program will prepare the next generation of scientists to accelerate the discovery, translation and application of cutting-edge regenerative diagnostics and therapeutics. Mayo Clinic Center for Regenerative Medicine, which is pioneering new approaches to rejuvenation and regeneration to transform medicine and surgery, is funding up to 16 five-year fellowships. These fellowships pay students a stipend plus benefits and cover all tuition costs. In the coming years, the program will pursue funding from additional sources, including the National Institutes of Health, says Dr. Hedin, who also is director of the graduate school’s immunology track and associate director of education for the Center for Regenerative Medicine. Development of the Regenerative Sciences Training Program has been a priority of Fredric Meyer, M.D., executive dean of education, Mayo Clinic. Leaders in the Center for Regenerative Medicine and the graduate school collaborated on organizing the program. Dr. Meyer is the Juanita Kious Waugh Executive Dean for Education. Students will gain experience in multiple labs on projects that involve regenerative sciences. Some courses will be taught in collaboration with the Karolinska Institutet in Stockholm. The program will spread knowledge about regenerative sciences throughout Mayo Clinic College of Medicine and Science. Students in all five Mayo schools will soon have the ability to attend the program’s classes in person or via teleconference. Dr. Hedin says the Center for Regenerative Medicine also is working with the college to develop a master’s degree program in regenerative sciences, organize a symposium on regenerative medicine to share discoveries with the world through continuing medical education, and add a regenerative medicine component to the surgical residency programs. The Regenerative Sciences Training Program will compete for outstanding doctoral candidates from around the world, Dr. Hedin says. The program will accept three or four students per year and, eventually, will have students on all three graduate school campuses in Arizona, Florida and Rochester. Students in the program will graduate with a doctorate in biomedical sciences with an emphasis in regenerative sciences and their track of choice.